Like the Mt. 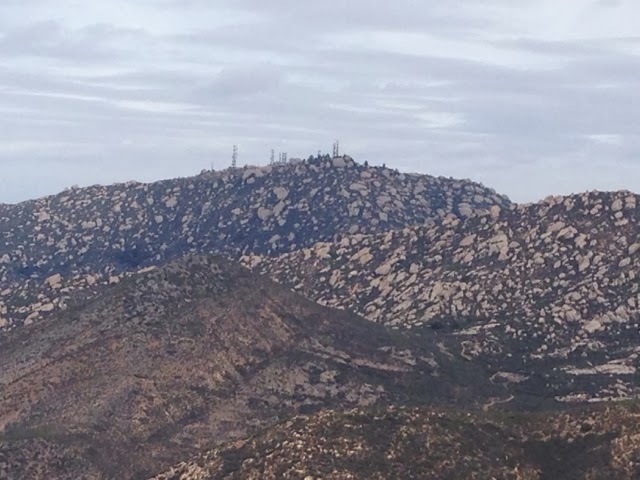 Woodson that I hiked yesterday, this mountain is Lso in Poway. 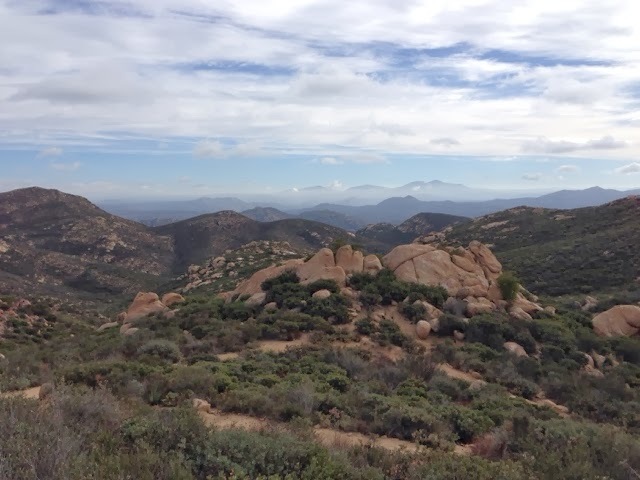 Iron Mountain summit round trip hike is 6.4 miles and 1100+ Elevation change. You start off in an easy to reach trailhead with plenty of weekday parking, but like the rest of the trails I have hiked they can be crowded especially on weekends. I got an earlier start today getting to the trailhead about 8:35. The temperature was cool from overnight and had cooled off each day with the increased clouds from the impending rain over the next few days. I drove to Iron Mountain by passing just south of My Woodson on a road that rose in elevation. Iron Mountson trail starts higher in elevation than Mt. Woodson. The trail starts off in this nice tree lined path. I started off with others just ahead of me and behind me. I soon caught up with a couple that came to a trail intersection and wasn't sure which way to go. I had downloaded an application on my phone the other day called All Trails and I have used it over the last few hikes as it has a trail map and with GPS it marked where you are on the trail. 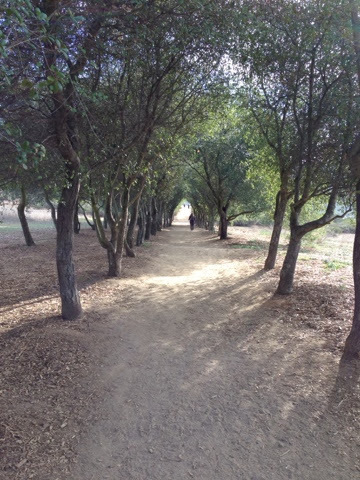 I pulled this app up and showed them it was a loop trail. They liked that and wanted the app. It's free. The beginning of the trail is only a gradual rise until you get to the base of the mountain and the trail is a series of switchbacks to the top. Just after meeting the couple and giving directions, I caught up to a wonderfully interesting woman who was also climbing named Veronique. We somehow started up a conversation that lasted to the top and all the way back to the parking lot. It made our 1 hour 10 minute hike up feel like 15 minutes. She is French and lives in the US for many years with her husband and two children. Our initial conversation was about teardrop trailer she could pull with her CRV. I had looked at them and they are a good alternative to tenting and less than larger trailers with more stuff. There are advantages to small teardrop trailers up to 5th wheelers and motorhomes. It basically comes down to what works for each person's situation. The hike quickly rises and opened up to vistas. You can see clouds coming in from the first of the two stoms to bring rain to us. Off in the distance is blue sky. This was south of our location and it stayed sunny there all day. Below is a view of Mt. Woodson from yesterday. I found out that Veronique and I have been to many of the same places in Europe over our lives. Having spent a lot of time in France over my career at Digital and Bruel & Kjaer, as well as, personal travels we had a number of things to talk about. We both love Annecy where she has traveled and where I worked in the French Alps. We also so enjoy Copanhagen and Tivoli Gardens. Veronique is also an avid hiker with plans to hike the Grand Canyon this weekend, which she has hiked before. I am impressed with people that hike the Grand Canyon as this is no small activity to accomplish. She has some concern about the rain this weekend that will spill over to the Grand Canyon. She spoke with the Ranger and he felt that it will not be all day rain. 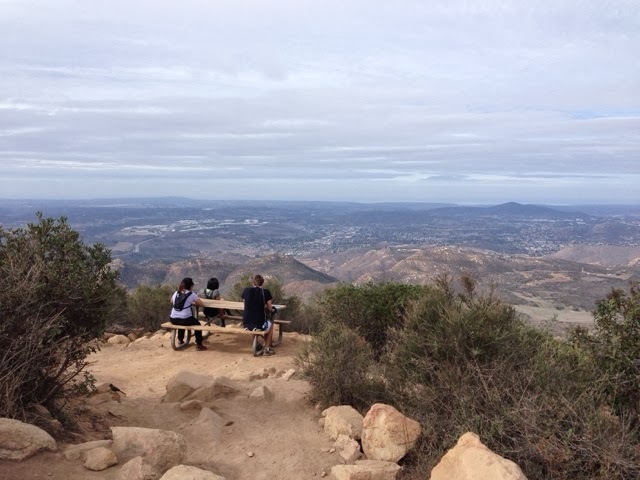 Here is the summit of Iron Mountain and the wonderful views. On the way down I asked Veronique to give me her assessment for my abilities to hike the Grand Canyon. She said that she felt that I was in good enough shape to do it. She brought my spirits up as I figured it was off my list of things to do unless it was in much better shape. Now I want to add that to my list of things to do and to do sooner than later. 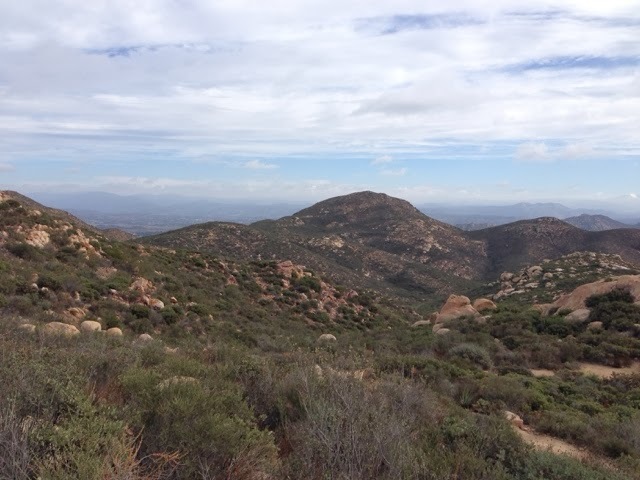 She gave me tips for other hikes in Poway that are less busy. This is the first time I have hiked that I talked with someone other than brief conversations and it was nice to have such a nice conversation with someone that also listens to NPR and listens to "Wait Wait Don't Tell Me". 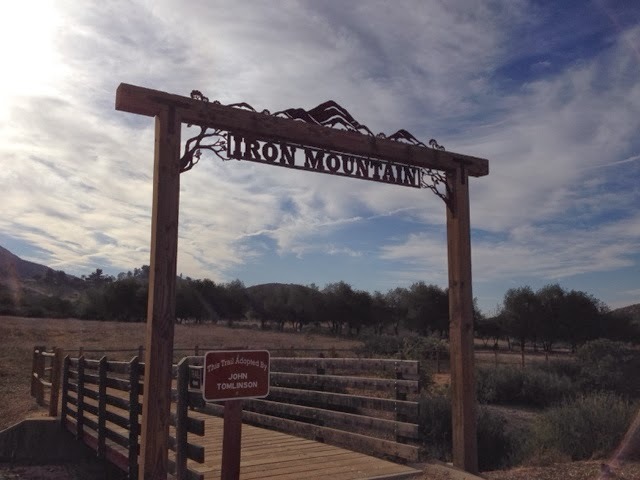 After I left Iron Mountain it was only noon and being only a few miles from Kit Carson Park I headed over to play 18 holes of disc golf. I haven't played disc golf for a few days and was feeling I wanted to get a game in before it rains for a few days. I had a solid game but I was mostly interested in practice so I worked on some of my techniques. It was a good afternoon with a quick game then back home.